Israeli Public Prosecution has revealed an Israeli settlement plan consisting of 800 new settlement units in Bethlehem, south of the occupied West Bank, Palestinian newspaper Al-Resalah reported yesterday. ____The plan was approved by the Israeli Housing and Construction Minister Ori Ariel, during Prime Minister Benjamin Netanyahu’s previous government at the end of last year. Several fanatic Israeli settlers invaded, on Saturday evening, Palestinian farmlands in the town of al-Khader, south of the West Bank city of Bethlehem, and uprooted hundreds of tomato and cauliflower plants and seedlings, in addition to destroying an entire field planted with Okra. ____Ahmad Salah, coordinator of the Popular Committee against the Wall and Settlements in al-Khader, said the Israeli extremists came from the illegal Israeli settlement of Efrat, built on stolen Palestinian lands. 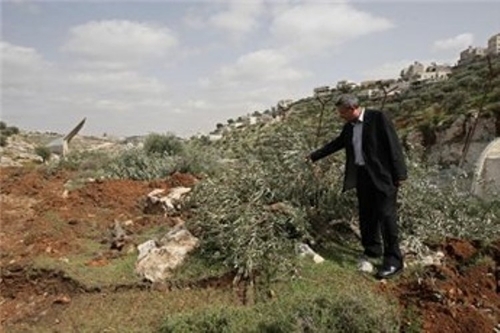 Israeli settlers uprooted hundreds of olive trees from the lands of al-Khader village, south of Bethlehem, March 20, 2013 (Photo flotillahyves.com). 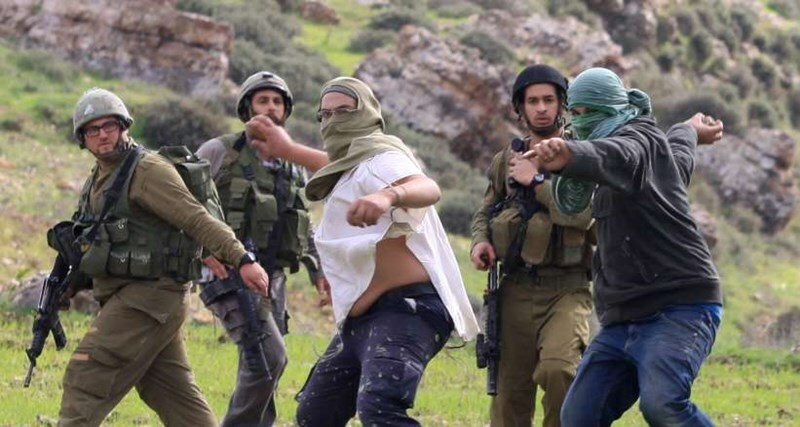 AL-KHALIL, (PIC)– A horde of Israeli extremist settlers, residing in the illegal Ma’un settlement, attacked on Saturday Palestinian passers-by and shepherds in al-Khalil’s town of Yatta, in the southern West Bank. ____ . . . the Israeli settlers, ESCORTED BY ARMY OFFICERS, attacked shepherds and unarmed citizens. JENIN, West Bank — Cries of joy were heard at the home of administrative detainee Sheikh Khader Adnan after he was released and carried on the shoulders of supporters into his town of Arraba, near Jenin . . . .
____After his release July 12, Adnan stepped out to the rostrum in front of his house and addressed hundreds of people who came from the West Bank and occupied Jerusalem to welcome him. He said Israel made a mistake by detaining him and has paid a high price. GAZA CITY (Ma’an) — Several Palestinian youths from the Gaza Strip heading to Saudi Arabia and European countries have been stuck at the Cairo International Airport for a month. _____Three young men and two young women were reportedly taken by Egyptian authorities from the Rafah crossing between Gaza and Egypt to the airport where they were prevented from travelling due to expired residency permits for their destination countries. During the 51-day Israeli offensive on the Gaza Strip . . . a group of Palestinian children fled to the beach to escape from the harsh and extensive bombing of houses, hospitals, healthcare centres and playgrounds; they went there to play football. ____They thought that the beach, an open area, was a safe place because it has never been used by the Palestinian resistance. Although the seven of them arrived on the beach safely, minutes later, four had been killed and three were wounded after being targeted by shells apparently fired from an Israeli warship. From Rashid Hussein, Al-A`mal al-Shi`riyya (al-Taybe: Markaz Ihya’ al-Turath al-`Arabi, 1990), Translated by Sinan Antoon. Rashid Hussein (1936-1977) was born in Musmus, Palestine. He published his first collection in 1957 and established himself as a major Palestinian poet and orator. He was the first celebrity poet to appear on the Arab-Israeli stage; other poets called him “the star“. He showed them it was possible to write about “human things“ – bread, hunger, anger.